Concrete floors, diamond plate on the wall and light switch covers, and a set of Mickey Thompson slicks to hold open its sign – a design, Burns acknowledges, that appeals to all ages and genders. 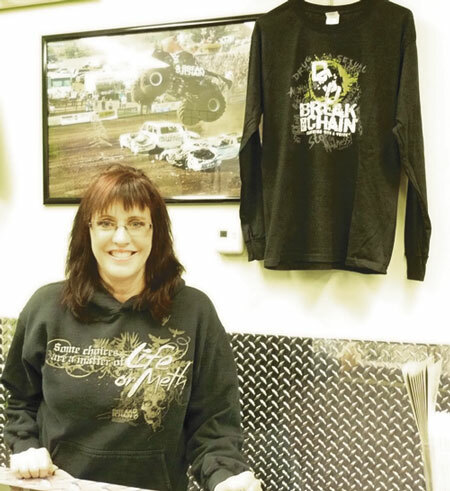 “Lime green and chrome fixtures, a tire clock, and pictures of the Break the Chain Monster truck crushing, bullying, are on the walls,” she said. Burns opened the store at 102 S. Center, Suite B, “right next door to Catherine Hemshorn Country Financial and across from Ditter Square” after attending weekly meetings with the Santiam Referral Group at De Nova Café in Sublimity. The group, started by Hemshorn, began to meet to discuss ways to support local businesses in today’s tough economy, Burns said. Break the Chain received the space on Oct. 13 and opened to the public on Oct. 31. “Once again our friends and family stepped up and combined their efforts to get the store open quickly,” she said. A grand opening will be held from 10 a.m. to 7 p.m. on Dec. 2, with a special surprise ribbon cutting at 12:30 p.m.
“You’re definitely not going to want to miss this!” Burns said with a bit of mystery. The celebration will offer super sales, drawings for a free T-shirt, food and fun. Kaine Horman of the Kyron Horman Foundation will also attend to give away “Bring Kyron Home” awareness items, Burns said. On Dec. 3, Break the Chain will deck out Hope, the Monster truck, for Sublimity’s first annual Christmas in the Country Light Parade. Since she has opened a storefront, Burns said local children drop in after school for a riddle and a piece of candy. Burns said adults also like to visit. Break the Chain was part of the anti-drug and anti-bullying parade and assembly at Mari-Linn School in Lyons. “And we have taught three freshman classes at Stayton High School on teen dating and domestic violence,” Burns said. Break the Chain Apparel gives a voice to those who are afraid to ask for help, being hurt by someone else or by their own hand, or who have lost their battle and have emerged on the other side. Burns invites everyone to come out to the new store. “We love the opportunity to show our messages of change, and give voice to the issues by simply getting dressed,” she said.